“Time heals all wounds”–we hear this all the time, as if time is the only way to get over the pain of certain experiences in our lives. I want to explore together how the belief in time is actually the wound. As we raise this belief to the light, not only do our seeming wounds disappear, but also our seeming entrapment in linear time. What does it mean to release the ego? How do we do it? The only way to experience what ACIM is pointing us to is to PRACTICE FORGIVENESS. But what is forgiveness? Jesus defines it as recognizing the false as false. And what is false? Everything we think we think and everything we think we know! This can seem daunting as you start to really dedicate your mind to Awakening. But what else do you have to do? You are either deciding to continue to sleep, experiencing fear and guilt with a little pseudo-happiness mixed in, or you are choosing to wake up from a dream that was made to keep your own divinity out of awareness. Jesus is inviting us to question everything that was made to cover over our inner radiance so that we can be free. The Course provides the tools for accomplishing two very essential things: Collapsing time (the illusion), and therefore shortening the amount of experiences we have by believing in “life” in this world; and finding peace while we believe we are still within the illusion. This is made possible through the help of The Holy Spirit, Who is the Voice for God. 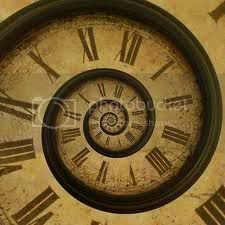 So let’s take a very close look at how our belief in linear time keeps us bound to guilt and fear. It’s like we are addicted to the tiny mad idea and we CHOOSE to keep playing it over and over and over and over!! At many gatherings around the world, David has used the movie Ground Hog Day to illustrate that we will all continue to play the same ego game over and over again until we begin to choose a different purpose for our life. Let’s stop the linear-time loop and awaken to the happy dream through forgiveness. It does take vigilance, but the alternative just seems like a complete waste of TIME!! !